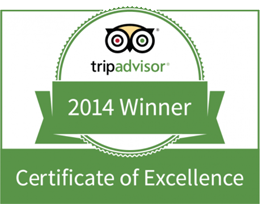 A 4 Star luxury coach house offering self-catering holiday accommodation for 2 people. 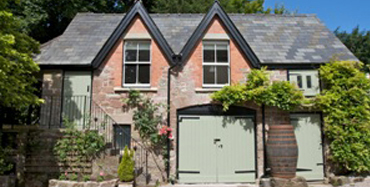 Situated near to Ross-on-Wye, Herefordhire in the Wye Valley. 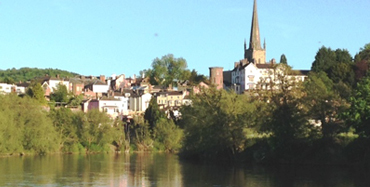 The Wye Valley in Herefordshire is a "hidden gem”. The countryside is outstanding and unspoilt. Situated in Goodrich, near Ross on Wye, Granton Coach House provides superior, self-catering accommodation for 2 people within the grounds of Granton House. Set in beautiful surroundings in the Wye Valley, it is an an ideal location for a holiday or short break, with plenty of activities available locally. This superb Herefordshire cottage offers extremely comfortable accommodation that is set entirely on the first floor accessed via stone steps and covered veranda. It has the original wooden floor,lots of exposed beams and a cosy wood-burner. The spacious open plan living area has high beamed ceilings, offering bright, airy accommodation, and the romantic king-size bedroom has an en-suite shower room. 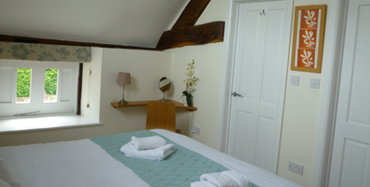 It is ideally situated, between Ross on Wye, in Herefordshire and Monmouth, in Wales. Goodrich has two friendly pubs, The Hostelrie and The Cross Keys, both serving good food and beer. Regular Food Festivals are held in Abergavenny, Ludlow and Hereford. Literary Festivals are held each year in Hay on Wye and Cheltenham and showcases for local artisans at H.Art and the Open Studios in the Forest of Dean are popular annual events. There is so much to see and do locally e.g. walking, forest trails, fishing, canoeing, horse riding or golf ( 4 courses nearby) and there are beautiful gardens to visit nearby as well as National Trust properties. Goodrich Castle, managed by English Heritage is just a short walk away and is well worth a visit. The market towns of Ross-on-Wye and Monmouth are close by as are the spectacular Symonds Yat, the Black Mountains, Brecon Beacons and the Royal Forest of Dean. Cardiff, Hay on Wye ( famous for it’s literary festival), Hereford, Malvern (famous for RHS Spring and Autumn Shows), and the Cotswolds are all less than an hours drive away. Chepstow and Hereford racecourses are about 30 minutes drive away and the Cheltenham racecourse, famous for the Cheltenham Gold Cup is 40 minutes away.The picturesque villages of the Cotswolds too are within easy reach. Central London is only about three hours away by car and Bristol, Cardiff and Birmingham airports are about an hour away with Heathrow airport being two and a half hours away. Please note: Sorry no children or pets.